From 13th to 16th of October the Interlift 2015, world leading exhibition for lift technology, took place in Augsburg. This time again CiA was represented with its own booth covering the topic of CANopen-Lift and also the known [[CANopen-Lift demonstrator]] as well as the new demonstrators have been shown to demonstrate the functionality of CANopen in lifts. 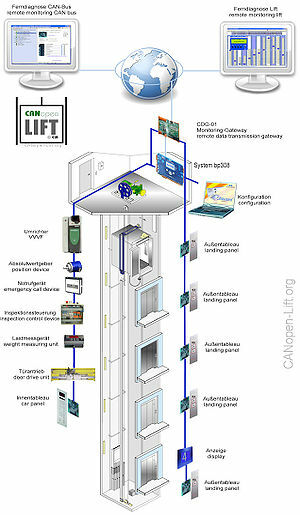 On a displays the [[CANopen-Lift_Image_Videos|two image videos]] were shown, which have been created by the MG Lift. CANopen-Lift was present everywhere on this exhibition. The standard is now accepted worldwide and is being applied in more and more products. Many manufacturers took the opportunity to get informed about the standard in a personal talk or to get specific advice for the development of new products. Many new and known CANopen products were also shown on various other booths. An overview and plenty of additional information about the Interlift can be found in the following article.